My dad and the patience he had with us as our little fingers tried so hard to make the hearts. We would cut them out so carefully, and then weave them together and the cuts weren't always straight nor was the weaving all that great. I'm a bit of a pack rat and I kept some of the ones I made as a child. As well as some of the more elaborate hearts Dad and Mom made. Just a few of the hearts. As you can see by the unevenness, this was cut out by hand. And I remember getting the 'right' kind of paper, either through a family member sending them to us from Denmark or being able to buy it locally, and the excitement of being able to make the hearts. Very, very simple. Two cuts,and voila! I got my pre-cut one finished, and hung on the tree. As you can see, I kinda 'munched' it a little. You can also hide candies and other assorted goodies in the hearts, and let the kiddo's find them. You can see some of the hearts here on the tree. And it started me thinking, just how incredibly lucky I am. Most of my memories of Christmas are positive. I never had to worry about either one of my parents drinking and not coming home, or having to hide if they had too much to drink and got mean. I never had to wonder if we would have Christmas dinner, it was always there. And while there may have been short tempers from time to time, they were short-lived and quickly forgotten. 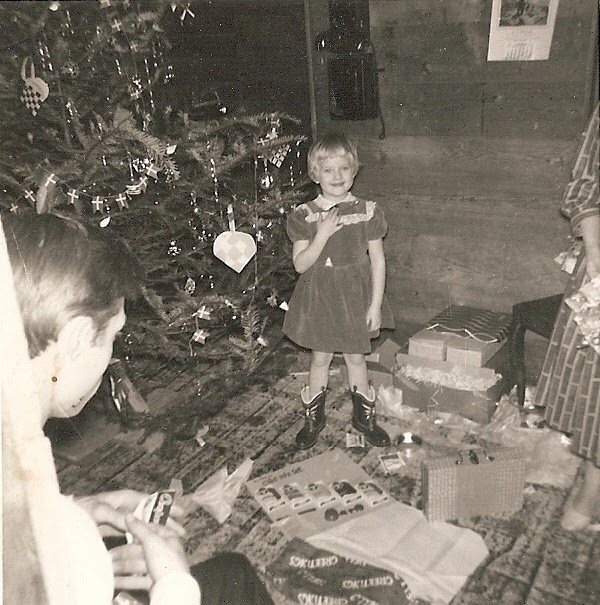 There was always something special under the tree for us. Nothing too elaborate, but something we could use or like. This was the year of the Red Cowboy Boots. I loved those boots. And as you can see, there are hearts on this tree as well. I also remember the year I got three Nancy Drew books, those are two of my most memorable Christmas'. Of course I did get into trouble cause I had to read those books right away. By the way I still have them, but the boots, they're but a distant, wonderful memory. Now you will have to excuse me, I need to go and make the Risengrød so I can feed the Nisse tonight. They can get downright nasty if you don't feed them on Christmas Eve. And we don't need any tricks played on us this coming year. MERRY CHRISTMAS... Please have a safe and joyful day.